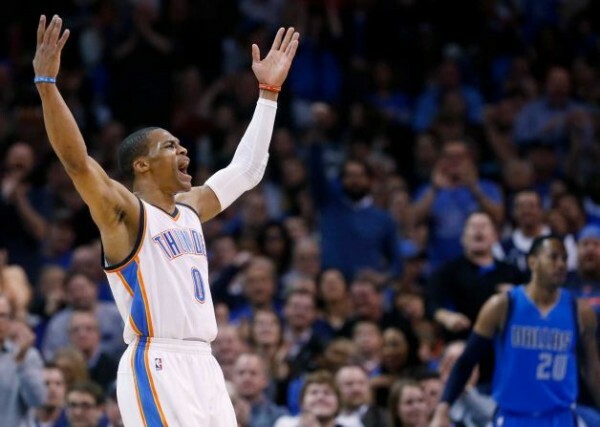 The not so nice Kevin Durant wasn’t not so good, but luckily he had Russell Westbrook to carry him and the Oklahoma City Thunder in a 104-89 win over the Dallas Mavericks. Maybe all this talking and anger from Durant, who actually hasn’t been very nice or likable for quite some time, made him lose a lot of the focus that makes him the most dangerous offensive player in the league. Or maybe, last season was him peaking, and he simply can’t recreate the perfection of his execution in the regular season for a season straight year. But lets put Durant badness aside. Russell Westbrook has been the team’s best player this season, and didn’t seem to let his All-Star MVP go to his head. He scored 34 points to go with 5 rebounds and 10 assists, getting a lot of help from Anthony Morrow in the first half, as the backup guard scored 16 points, 14 of them coming in the first two quarters. Kevin Durant didn’t really help. He scored 12 points on 4-of-14 from the field in one of his worst performances in a very long time, while Serge Ibaka had the first 20-20 game of his career, finishing with 21 points and 22 rebounds. The Thunder are now up to 29-25, solidifying their place in the 8th spot out West. Unlike the Pelicans or Suns, it seems like the Thunder are too good to let go of a spot they shouldn’t even have to worry about if injuries wouldn’t have gotten in the way. The Mavericks were off the pace right from the start. Dirk Nowitzki led them with 14 points, but nothing was really going well for them in this game, shooting only 36.3% from the field and struggling to do anything to slow down the Thunder.